Try using nasal breathing for both the inhale & the exhale if that is comfortable for you. Find a quiet space where you can spend at least 5 minutes uninterrupted.Lying down on your back wrap a blanket around your waist, place your eye pillow over your eyes and lay a pillow on the front of your body chest to pelvis. Spend a minute getting to know how your mind and body feel right now, then you can observe any change afterwards. Allow your eyeballs to relax. Visualize them moving inward, dropping gently towards the heart. Breathe in and out through your nose for about 1 minute then start counting the length of your inhale & exhale. Let each count be about 1 second it doesn’t need to be completely accurate. Let your breath be natural and try not to force it. If it feels good for you, start to lengthen your inhale and exhale by 1 count. If this makes you feel anxious then go back to just observing your breath. Essentially the most important thing is to relax and breathe. As a teen and young adult I was often in pain. I had quite a few horse accidents and a car accident but nothing in particular was injured badly. A few fractured bones in my lower spine and some whiplash was the worst of it. These injuries did not explain all of my pain though, and most of the time no one, my regular doctor included, believed that I was in any pain at all. Even though my doctor didn’t believe me she tried to help by sending me to specialists. I saw neurologists that pretty much put me on harsh drugs and kicked me out the door, a rheumatologist who said nothing was wrong and to come back when I was an adult and I went to a sports medicine clinic where they lost my file multiple times and gave up on me because the exercises that they had me doing were making things worse. I also received multiple bone scans (pretty neat tests) that revealed minor Ankylosing Spondylitis, but they told me nothing about it or what to do for it. Still, all of these doctors couldn’t explain the actual pain I was in or take it away. Wow, that’s a lot now that I see it typed out. All of this started when I was around 13 and continued until recently. I was diagnosed with Fibromyalgia when I was 24. I was glad to have an answer, however this diagnosis is not something I truly believe. I’m all better!! Well I still have some issues but not nearly as many as I had before. Before what? you ask…. Before PILATES, YOGA, and PROPER NUTRITION!! YOGA & PILATES – well this is where everything really changed!! Once I was taught how my body really works and how to use my core muscles properly by my Pilates Instructor here at Balanced Motion, I could already see a difference. For my body the Pilates classes were too much so I started slow with Yoga. I used the knowledge about my core muscles in my Yoga classes, which for me was the best thing. I have been doing Yoga as much as possible for the past two years now and WOW!!! My body is completely different. Don’t get me wrong, I still have some joint problems and I adjust for those when doing Yoga. You would be amazed at what proper breathing and posture can do for your body. I would not be the person I am today or the person I will be a year from now or 5 years from now without Pilates and Yoga…Thank you Sherry Morton-Jibb and Lisa Goddard! NUTRITION – now for the hard part! I LOVE FOOD, I love the taste, texture, smell…everything. Food, especially sugary food is my addiction…and addictions are hard to quit. My sister is a Registered Holistic Nutritionist so of course her voice is always in my head when I’m eating crappy food (which I still do from time to time…I refuse to give some things up). But she has helped me alter my eating habits for the better. Once you learn about what certain foods do to your body, especially in excess, you’ll be amazed. Once I cut out red meat (causes inflammation), limited my dairy (also an inflammatory food) and wheat and of course reduced my sugar intake drastically I physically, emotionally, and spiritually felt different…better…new! I must admit this is hard and I slip up from time to time and don’t take the time for myself that everyone requires to stay healthy and sane in this world but I do what I can and I am determined to do better. Yoga and proper, real food have changed my life and got me through the pain I was in, and will continue to change how I feel physically, emotionally and spiritually. Well another Fall is upon us here at the Studio and we can’t help but reminisce about our Free Community Yoga Event that took place last year at this time. Being that this was our first crack at having an event like this it will always have a special place in our hearts. Having this event in the Fall last year was a bit of a gamble weather wise and as it turned out it poured rain and was windy and awful outside. This was a blessing in disguise as we ended up being able to use the gorgeous gym facility at the Ecole Publiques Des Navigateurs. We were ever so grateful to have access to this facility to keep warm and dry and have an hour of Community Yoga. We ended up having little over 100 participants that day! Not bad for a new event! We also had the pleasure of having the Northern Star program (a local community mental health program) bring in some healthy snacks for people to purchase. All proceeds went to the Northern Star Program. The snacks were DELICIOUS! The day was a success and we couldn’t have done it without the great people of Ecoles Publiques Des Navigateurs and Northern Star and of course …the participants! We hope that each year our Event will grow and grow. Having a community that can get together and do something that is so good for your mind, body, and spirit (like Yoga and Pilates) is truly a gift. We will work together to make this Event special for everyone each year. I started doing yoga in my last year of my undergraduate degree when I was struggling with weight and anxiety issues. A close friend had been bugging me to try hot yoga. I had never been one to enjoy exercising but I decided to give it a go. We accidentally ended up at a 90 minute advanced hot yoga class and I spent a good 75% of the class lying in savasana (corpse pose) while sweat was pouring out of places I didn’t even know possible. Though this would be considered a disastrous first experience, the amazing thing was, the minute I stepped out of that studio, I felt incredible. I felt lighter, happier, and more in tune with myself than I have ever felt before. The next day I was back at that studio, making sure to take a 60 minute beginner course this time. That year, there was hardly a day I missed a class. I gained control over my weight and it helped me deal with my anxiety. Since then, there has yet to be a problem that yoga has not been able to help with. Which makes sense that, just under a year ago, when I was unhappy with where I was in my life – job, relationships, etc., I again turned to yoga. Since I have always been one to say “go big or go home,” I decided to look into Teacher Training Programs in India. I found a few that intrigued me and after careful consideration and a lot of research, I decided to apply to the Himalaya Yoga Valley for their Ashtanga teacher training course in Goa. I had a lot to do to prepare for this, as I was just getting over some issues with my back, but between my physiotherapist and the amazing staff at Balanced Motion, I was able to prepare myself for the month long intensive training program. Every day in India I woke up in my hut at 6am. I would jump in the ice cold shower, and head to the shala. The shala was a beautiful place. It consisted of 8 stone pillars and a roof. Different coloured bug nets wrapped around the outside, and curtains were available to help shelter ourselves from some of the sun. The floor was a soft bamboo, and all around us was the sounds of cows, pigs, birds, men at work and the Indian Ocean. We began our day at 6:30, with chanting, meditation and pranyama (breathing exercises). Afterwards, we were served tea and fruit. From 8-10 was our morning Ashtanga yoga practice, and then we had breakfast. Each morning, we were in silence until 11am, which meant that, unless we had a question for our teachers, we were not to talk, but to be mindful of our movements and our thoughts. At first this was hard, but near the end, it was a blessing. It is actually still weird for me now to talk over breakfast. After breakfast, we would have a lecture on any number of topics – anatomy, philosophy, ayurveda, sequencing, ethics, business, etc. We would get a two hour break for lunch, to either catch up on studies, or go to the beach. At 3pm would have another lecture, and then a final yoga class, ending our day between 6:30 and 7pm. We would all go to our respective huts to shower. Then we would meet up for dinner and tell stories, ask questions, and just enjoy each others’ presence. I have never in my life met a group of people that were so accepting and so loving. This was our schedule every day. Saturdays we generally finished early and Sunday we had a day to ourselves, though most of us would beg our teacher, Lalit, to teach us another class anyways. Every day felt like a week, but not in a bad way. I was just learning and experiencing so much, that the days felt so long, and yet it all ended so quickly. We started to teach each other well into the second week of our training, so by the end of the month, we were all very confident and talented teachers. My body and mind was challenged in ways I never thought possible, and I have come out stronger because of it. I am appreciative of every moment, be it good or bad, that I have had on this journey and know I am a better person for it. We graduated on Diwali, the Hindu festival of lights. There were celebrations and fireworks everywhere we went. It was the perfect ending to an amazing month. Once I landed back in Canada, I realized that a new journey had started. 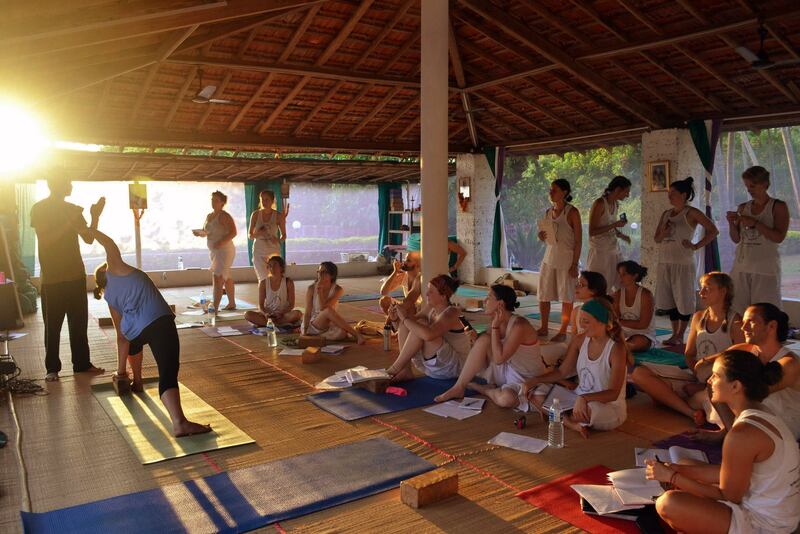 Now I get to pass my knowledge and experience of Ashtanga yoga to the people I meet, and inspire them, the way my yoga teachers have inspired me. I am grateful to all the people who have helped me get here: my parents and the rest of my family, my friends, as well as the lovely ladies of Balanced Motion. You have all given me so much support and love and I am forever grateful.